There are many ghostly tales that have been told about the river regions of Illinois. 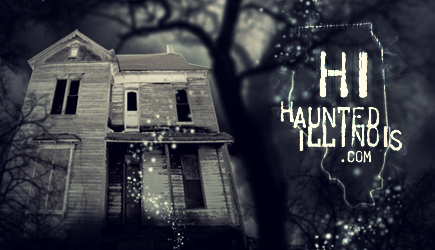 One particular tale comes from Calhoun County, a region that is divided by the Mississippi and Illinois Rivers and it tells of an old cabin that was once located near a place with the unlikely name of "Hauntstown". According to the story, the cabin belonged to an old recluse named Jesse Barnes who, years before, had amassed a considerable fortune in the lumber business. It was said that he had owned several steamships and they made regular runs downstream to New Orleans. Jesse was also said to have been an eccentric, especially after his wife had died in childbirth years before, and he had a distrust for banks and bankers. Because of this, he kept all of his money hidden at his home near Hauntstown. Neighbors in the area often talked about Barnes and his elusive treasure, although none of them knew for sure where he kept the money hidden. The old hermit was not a very friendly man and rarely allowed anyone on his property. Sometime prior to 1910, Jesse passed away and after the funeral, the rumors once again began to circulate about his hidden fortune. The money had not been with the rest of his personal belongings and most in the area were sure that it was still hidden somewhere on his property. One night, the Barnes cabin mysteriously burned to the ground. Many believe the fire may have been the work of looters, hoping to flush out the location of any gold coins secreted with the structure. Regardless, the blaze did not deter local folks from searching for the hidden loot. As these things tend to happen, other rumors began to spread. Those who ventured out to the old Barnes cabin to look for the gold began to tell of a ghost who haunted the place. Most believed this spirit was that of Jesse Barnes, still trying to hide his money. Were these stories true? Or were the merely the creation of treasure-hunters who were trying to keep other people away from the property? That much is unknown but according to one story, told about a particular treasure hunt, it seems that supernatural forces may have been at work after all! One night, a small group of people came from the local settlement of Batchtown to look for the treasure. One of them, a woman named Elizabeth, had recently been to see a Spiritualist medium. The medium had informed her that she was soon going to come into a large sum of money, which she would find hidden beneath a hearth stone for a fireplace. Excited, Elizabeth convinced three male companions to accompany her out to the site of the old Barnes cabin. She had heard the stories of the missing treasure and was sure this was the money she was due to discover. They arrived at the wooded cabin site very late in the evening. As they drove back along the winding, dirt road through the forest, they noticed the flicker of lightning in the dark sky. A thunderstorm was quickly approaching, so they knew they had to work fast, or face being trapped in the woods at the end of washed out and muddy road. Armed with shovels and a large lever, the group quickly got to work. They found the hearth stone amidst the ruins of the cabin and except for the crumbling chimney, it was one of the only remaining structures from the house. After about an hour, they had dug far enough beneath the stone to begin to raise it up from the ground. The stone slowly raised a few inches and as Elizabeth bent down to peer into the dark hole, she heard the sound of a moaning voice that seemed to be coming from beneath the stone! She sprang backwards and as she did so, she collided with the men who were levering the stone. They fell to the ground and the hearthstone pitched sideways, uncovering the hole underneath it! None of the four members of the group ever spoke about what they saw that night. Whether or not the treasure (or something worse) rested in that hole remains a mystery. What we do know is that they managed to get down the dirt road through the forest before the rain washed it out completely and after arriving home, they were never heard from again. The last trace we have of Elizabeth is a letter that she sent her mother from New Orleans. She never returned to Batchtown again. The following day, a neighbor who lived along a woods trail not far from the Barnes cabin, decided to walk down to the old place. He was fairly sure that lightning had struck near the ruins of the cabin the night before and wanted to see what damage had been done. He later told, after hearing the story of the treasure hunters, that when he arrived at the remains of the house, he saw nothing out of place. The hearthstone was in the same place it had been the last time he had seen it and as far as he could tell it had never been moved. The neighbor also firmly stated that he did not believe in ghosts. So, what had they seen that night? Was the stone really moved out of place? Or was the secret of the missing fortune covered over by supernatural forces? I can't really say for sure. Of course, if the story is true (or even if it isn't) that means that a fortune in hidden treasure is still lying out there in the woods near the former site of Hauntstown - just waiting for someone to find it!